Gail has recently returned from her latest trip to Ladakh – see her story below. This trip was primarily to pay all the school fees, pick up outstanding receipts and try to see as many of the children as possible. This is quite a feat as everything takes quite a while – sorting out paperwork with schools and travelling to different villages to meet with the families. It is just so lovely to see even in a few months the children have flourished more. It is also good to meet our new children as they are shy in the beginning, but by my second visit they are beaming with huge smiles. We set aside one day when some of the parents who can, come to us. We take tea and settle all the outstanding receipts. Thanks to Sandra I have a list of admin tasks as long as my arm. We keep files here in Ladakh and in the UK which we update. What I have found on this trip and the last trip is that the school fees have increased considerably, which makes it difficult for the parents. We have asked all our sponsors to consider giving extra this year to help with these increases. I also felt that generally prices have gone up here, but wages are still very low. A labour working female shifting stones on the roads earns £20 for 7 days work. Although Ladakh is in India, unfortunately it does not have the same earning capacity as other areas because of its remoteness and geographical position. The families struggle to pay the extra cost, even though we try to encourage them to budget for this which is sometimes impossible if there is no labour work to be had. On the last two days, Rinchen and I went on a little road trip to a remote area where a permit was needed for me as a non Indian. It was an off road, bumpy drive over the high pass called Wari La of about 17,000ft…. It was breathtakingly beautiful. We arrived at the village called Tangyar which was about 13,000ft above sea level. We stayed in a teacher’s house who worked at the Government school which we visited. It had 6 children in it and two teachers. This is what tends to happen in these remote villages – the Government schools have hardly any children in them and whilst it is good when they are young as they get older the facilities are not there, for sport , etc. so the children tend to go into the schools in and around Leh and go into hostels. We stayed in the remote village over night, and then headed back to Leh on the bumpy mountain roads across the high pass again. It is always good to visit the remote villages and meet with the local people too. I would like to thank everyone who supports Himalayan Children because it does work, it helps children on the path of life, as I have seen over the last 6/7 years. Some of our children have left school to go onto higher education and I see them flourish. 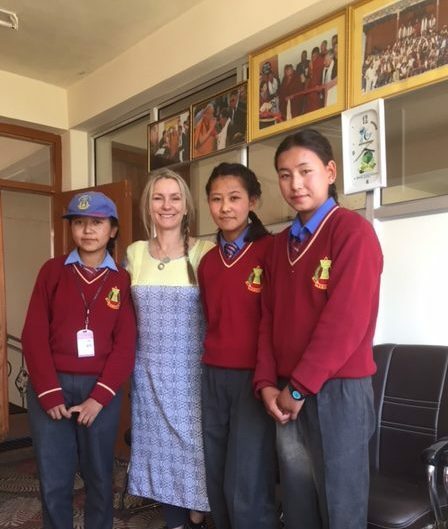 It is always a joy for me to see the children each visit, the changes in their confidence and their growth… some of them are taller than me which isn’t hard, but Ladakhi people are not known for their height! I have also made some lovely relationships with the parents of the children and I know their lives and how they struggle. Thank you again everyone who supports Himalayan Children. Helping on the path of life.